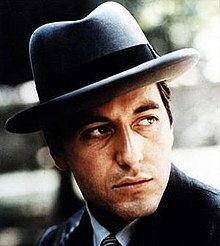 One of my favorite movies is the Godfather. My favorite scene comes near the beginning of the film. Vito Corleone (the Godfather) is recovering in a hospital from an assassination attempt. Michael Corleone (his youngest son) goes to visit him, but when he notices the guards are missing, he realizes a second assassination attempt is imminent. He stands outside with his driver, hoping to give the impression that they are, in fact, guarding his father. Michael’s driver is overcome by his fear, believing a drive-by shooting is imminent. He tries to light a cigarette but can’t do it, because his hand is shaking so much. Michael takes the lighter from him and holds it out. Michael feels afraid also, but his hand is steady. This is a turning point in the film. From that point on, Michael knows that he has what it takes to lead the family. He looked his fear in the face and didn’t back down. A similar event occurred in another one of my favorite films, The Last Samurai. When we first meet Tom Cruise’s character in the film, he is a loser and a drunk, overcome by his demons from the past. He gets recruited to train the Japanese army, and is forced into battle before his troops are ready. His troops get destroyed by a much smaller army of Samurai soldiers and Cruise is captured. When they take Cruise back to their camp, one of the Samurai brings his sword down on Cruise’s neck, as if to execute him, stopping just before slicing his head off. Cruise’s character doesn’t flinch, staring down the soldier. Like the scene from the Godfather, this is a turning point in the movie. Cruise looked his fear in the face and didn’t back down. All our great heroes have a moment like this. Bruce Wayne. Rocky Balboa. Luke Skywalker. They are faced with their deepest, darkest fear, and there is a choice to be made. Do they avoid what they fear? Do they run and hide, back to where things are “safe”? Or do they face their fear—fully—and step toward it, no matter the consequences. To be successful and reach our potential, I believe that we too, must look fear in the face and not back down. I imagine there is something that holds you back or keeps you up at night. Maybe it is fear that you aren’t good enough, or that you will be rejected. Maybe it’s a fear of failure, or the unknown. To be the person you are created to be, you must look your fear square in the face and stand undeterred. If you come through to the other side, you will emerge stronger, ready to take on whatever life has for you.